Ryan Villopoto is retired. But he sure doesn’t act like it. For a third straight week, he was racing. After winning the Pit Bike of Nations at RedBud, RV made a surprise return to Monster Energy Cup. 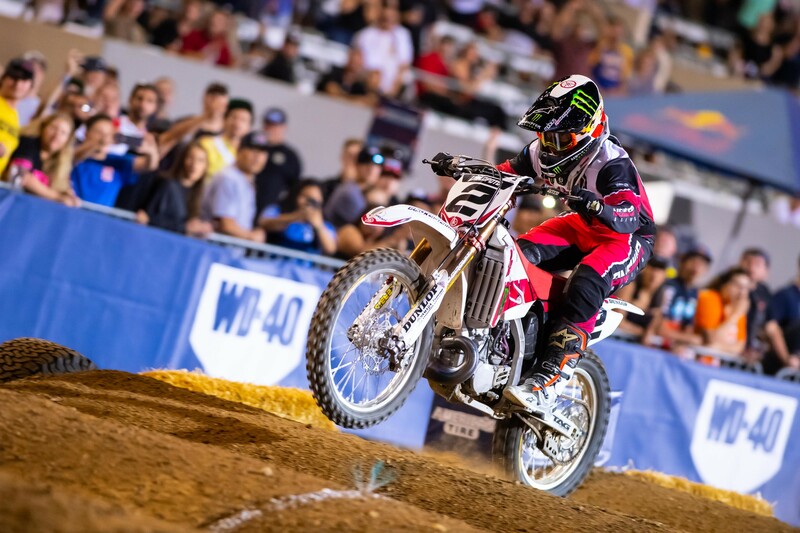 On Saturday, he raced Red Bull Straight Rhythm for a second straight year, finishing third overall in the 250cc Class. Steve Matthes caught up with “the best retired guy ever” after the race. Racer X: Better than last year. Your races with Jordon [Smith] and JG [Josh Grant], the third ones, were epic. I think they were the best races of the night. Ryan Villopoto: They were close. I don’t know. I just struggled. I was wide open, as fast as the bike would go. Right off the start before the dragon’s back, it seemed like they would just get me by half a wheel. You’re telling me, bro. My PulpMX was getting yarded. I know. We were same bike, same motor builder. So for whatever reason, and then I was just having to try to make it up. I definitely felt better on the right lane. One guy said left was better, he thought. He doesn’t know what he’s talking about. The right one was better. How do you make up time? You weren’t scrubbing like crazy, but you were soaking things up with your legs. I wouldn't say I’m the best at some of that stuff, but I felt like I was pretty strong in the whoops, but that’s too late by then. I don’t know. Just hitting your marks. It’s like half a tenth, half a tenth. Normally when you talk about supercross stuff you talk about a tenth here, a tenth there. I think here it’s like a half there and hang a wheel there, and that makes the difference. But all in all, it was fun. It was a good time. Last year you talked about you didn’t even care how you did. It was a great event. You feel the same way? One spot better. I’m on the box. Dunge, I’m glad you didn’t win because now we’re two and three. If you were one and I was three, then I’d be a little more upset. I came here to obviously to do well for my sponsors and things like that and just put on a good performance, and I felt like I did that tonight. I don’t know if you say those guys are better. I don’t know where I got beat, but I got beat. They were really good off the start. Are they 300s? Do we know? I’ve gotten a couple confirmations that they are, but are we really going to find out? We should protest. I’m going to claim. I don’t think there’s a claim rule. I asked [Jeremy] Malott about protesting Bowers’ 500. He said there’s no protesting. It doesn’t really matter. It was just fun altogether. You were one of the only guys—you didn’t like the looks of the PulpMX Yamaha? When you said the Noleen [Yamaha look], then it made more sense. But I don’t think the Noleen bikes are very good-looking either. How’s the [Damon] Bradshaw look? I’m very partial to Bradshaw, so it does look good. I hate to say that. I just didn’t want to take the Pro Circuit stickers off the front fender, but I even had cursive Villopoto made. Like the old school Yamaha guys on the front fenders. For the front yeah. RL told me to do that. We didn’t want to give up the Pro Circuit logo. Tell [Mitch] Payton to pound sand. Look how cool that is. I have a whole workshop there. He does a lot for me. Ryan Villopoto, the people’s champion.